On Friday 5th April, KSDL hosted our bi-annual Partners Forum held in association with Stadium Partner Yorkshire Payments. We were delighted to welcome our guest speaker Dominic Troulan. Dom Troulan shared his extraordinary life experiences and delivered invaluable insights into physical and mental courage, exercising judgement and situational awareness, negotiation and persuasion, leadership and decision making. Whilst relaxing at home in September 2013, he took a call from a family friend which led to the most challenging situation he had faced. The call launched him on a rescue mission to Westgate Shopping Mall, which was under attack from terrorists. In several sorties under fire, Dom single-handedly rescued many innocent civilians while the Kenyan Armed Forces attempted to establish a cordon around the building. For these repeated acts of conspicuous gallantry, Dom was honoured to receive the United Kingdom’s highest civilian award for bravery the George Cross, in the Queen’s Birthday Honours List 2017. 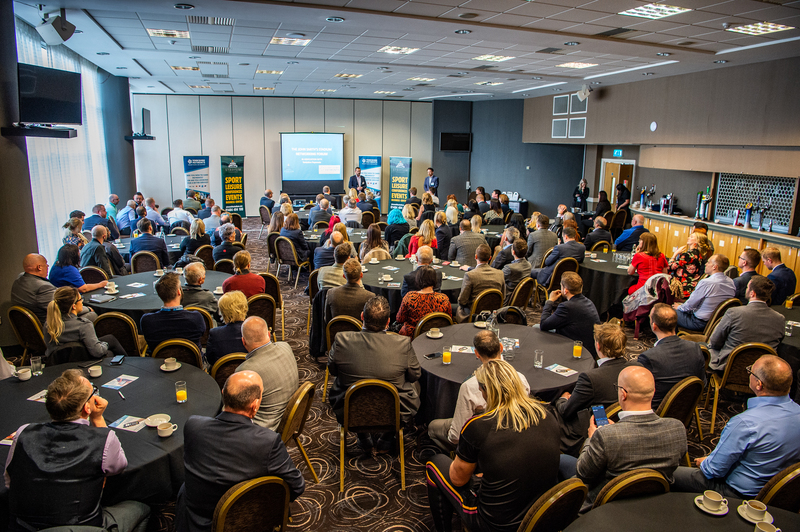 The event was a huge success with around 121 delegates in attendance, with many praising the standard of food, delivery of the event and the inspiring speech from our guest speaker, who proved to be very popular with the audience with lots of great feedback! As this event is by invitation only, please contact Michaela Brook on 01484 484124 if you would like to be considered.